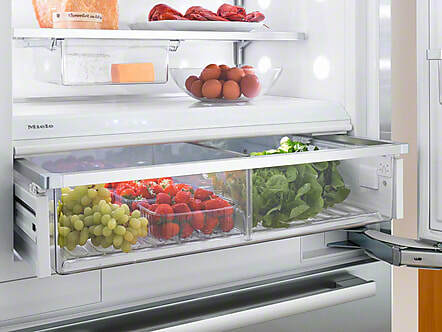 ​A perfect match: food can be stored in ideal micro-climates in the moisture-regulated drawers. 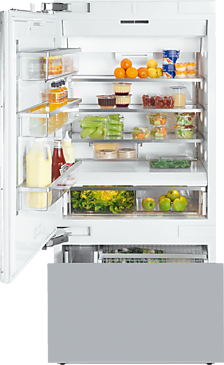 ​Fresh for up to 3x longer: The perfect storage temperature for fruit, vegetables, fish, meat and dairy products. 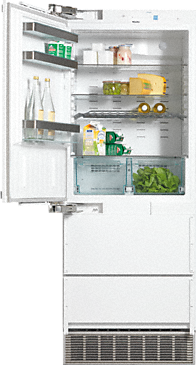 With the IceMaker your Miele bottom-mount units make up to 100 fresh ice cubes per day, fully automatic. DuplexCool ensures two separate cooling circuits for bottom-mount fridge-freezers. This provides optimum cooling for each compartment. 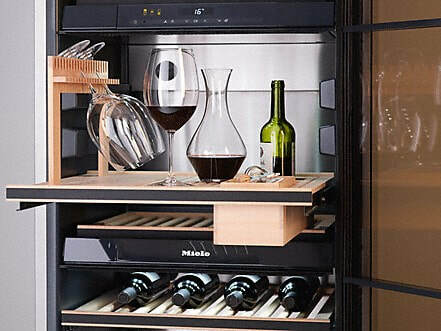 for perfect enjoyment and timeless design with its Push2open and SommelierSet. Prepare fine wines professionally for decanting. Enjoy champagne and white wine from chilled glasses. Drink perfectly conditioned wine even from opened bottles. And have all equipment you need for this always ready at hand. Each bottle rack has a label which you can annotate with chalk for a quick overview of your wines: Here you can note the origin, grape variety or vintage, for example. The NoteBoards are magnetic and can be removed from the shelves for writing on. 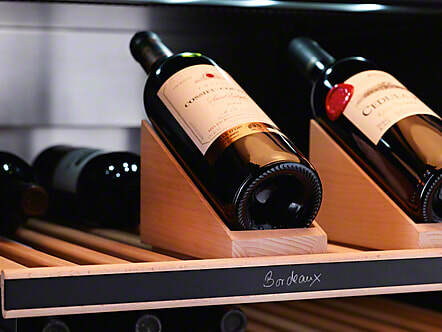 The adjustable bottle racks hold every size of bottle securely. The individual slats can be moved easily to suit every bottle shape. The selector allows you to present the highlights of your wine collection. The bottles appear slightly raised in the soft light of your wine unit. An effective presentation of exceptional wines.